First pressing issued in a short-run laminated sleeve Turquoise lettering, withdrawn. Released on Atlantic plum & red label with tracks credited to 'Superhype Music' and 'Jewel Music'. This 1st pressing variation has turquoise sleeve lettering (like this one) and Superhype Music/Jewel Music Publishing credits labels. This issue has on side one the "misspelling Superhype" label lists songs 1, "3", 4. as Superhype Music and then 3. again as Jewel Music. This 1st pressing variation has orange sleeve lettering with grey stripe across the base of the front cover and (Superhype Music/Jewel Music Publishing credits labels). This 1st pressing variation has orange sleeve lettering with grey stripe across the base of the front cover and misspelling Superhype Music Publishing credits on label side one). This 1st pressing variation has orange sleeve lettering with the corrected stamped matrix number on both sides which have the second 8 scratched out and (Superhype Music/Jewel Music Publishing credits labels). The 2nd pressing has orange sleeve lettering with grey stripe at bottom on front cover and without Superhype credits with instead Warner Bros/7 Arts. Publishing credit printed in two lines on the labels. The 2nd pressing has orange sleeve lettering with grey stripe at bottom on front cover and without Superhype credits but with instead Warner Bros/7 Arts. Publishing credit printed in one line on the labels. The 2nd pressing has orange sleeve lettering without grey stripe at bottom on front cover and without Superhype credits with instead Warner Bros/7 Arts. Publishing credit printed in two lines on the labels. Not to be confused with reproductions, which despite having turquoise lettering on the front, will not have the title or catalogue number on the spine. Reproductions might also have different colored vinyl and list "LZ-A" and "LZ-B" on the corresponding sides of the deadwax, rather than the catalogue number. The 3rd pressing on green and orange label has a different catalogue number (K 40031) with Superhype Music/Jewel Music Publishing credits labels and also has orange lettering sleeve. The 4th pressing on green and orange label has a different catalogue number (K 40031) with WEA on labels and also has orange lettering sleeve. 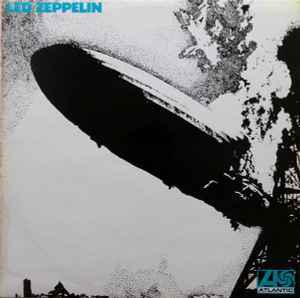 From Polydor new releases for april '69: "The heavy new group led by ex-Yardbird Jimmy Page. Produced by Jimmy Page." It is a complete myth that Led Zeppelin were ever called The New Yardbirds. The official name was The Yardbirds, then it became Led Zeppelin. The 'New' only came into it when certain promoters decided to make a big deal out of them being a new version of the band on gig posters, this being typical 1960's thinking (i.e 'new' equals 'exciting'). It was never officially part of the name and such references would've quickly disappeared had they continued under the Yardbirds moniker. Got a turquoise copy of this with Goldrush in turquoise across the front in large letters- was this some kind of promotion? How much would a UK 1st issue of this LP sell for if autographed by all the band ? An Expert on BBC's Antiques Roadshow has just said 'about £500 each'. I'm no expert but I think that's a little light ?? Yes, he'd all their records by the looks of it & all the Rolling Stones autographs too. Mine is French too, sleeve printed by offset, same number etched in run out, same price code on back sleeve, but with a B sticker on the U. Little differences on the label : there's "N°" behind 40031 and Chappell on Side One is written on top of SACEM, not under. Seems to be more or less the same edition but my record is very heavy ( 180 g) . Is it the same for the other edition?? Turquoise lettering anyone? Has to be some sort of mistake. an experiment deviating from the earlier US release of 12/20 Jan 1969, or a mix up regarding the films required for the offset litho presses. IT is not a rare edition, but difficult to find in top condition. Someone please ask Jimmy Page whilst he is talking to the media. I just found a sealed copy of this album. And the best thing about it is I got it for nothing. It was among a box of records I found at a rubbish dump shoved in the corner by hundreds of hub caps. The rest of the records were worth nothing. But this one. Even the plastic its sealed in isn't even scratched. Amazing. No way im selling this. Which are the best versions?